Scott Morrison, Emily Peters and I have just uploaded to the arxiv our paper Knot polynomial identities and quantum group coincidences. In this paper we prove several new strange identities between certain specializations of colored Jones polynomials and other classical knot polynomials. For example, we prove that for any knot (but not for links!) the 6th colored Jones polynomial at a 28th root of unity is twice the value of a certain specialization of the HOMFLYPT polynomial (for the exact formulas see the first page of the paper). To recover the knot polynomial identity, one computes the Reshetikhin-Turaev invariant for a particular object on the left (getting half the relevant colored Jones polynomial for knots, but something worse for links) and for the corresponding object on the right (getting the specialization of HOMFLYPT). For most of these coincidences we give no fewer than three separate proofs, as well as an exciting diagram which explains the proof in pictures. After the jump I’ll sketch the flavor of these different arguments. One of the biggest difficulties in writing this paper was getting all our conventions straight because we constantly need to jump between different quantum groups, and knot polynomials. Life becomes very messy if you’re using one convention for q in one place and a different one somewhere else. 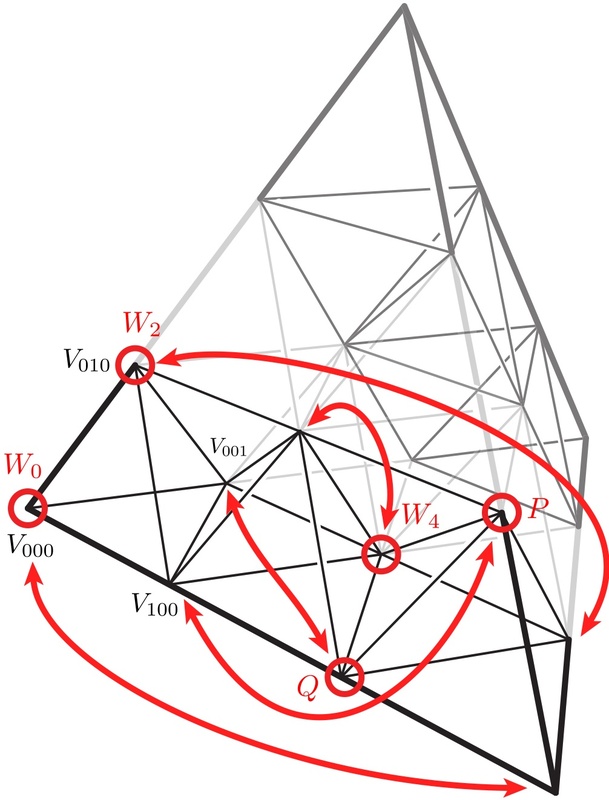 So one goal of this paper is to be “full of correctness.” We hope that if you ever wanted to know about the relationship between quantum groups and diagramatics you can just look at this paper and have nice consistent conventions for everything. In particular, if you notice even small errors we’d really love to hear about them so that they can be fixed. The first two ways we prove these identities is through a general yoga which allows you to recognize specializations of the classical knot polynomials (i.e. Jones, HOMFLYPT, and Kauffman which come from quantum versions of the classical groups SU, SO, and Sp). Suppose you have a knot invariant coming from a simple object X in a braided tensor category. If then the knot invariant is trivial. If with M and N simple, then the knot invariant is a specialization of the Kauffman polynomial or the Dubrovnik polynomial. Furthermore, by looking at the eigenvalues of the braiding one can easily determine which specialization you’re looking at. These schema for recognizing knot polynomials are well-known (in particular results of Kauffman, Jones, Kazhdan-Wenzl, and Wenzl-Tuba), but we’ve collected it all in one place. The last example, involving G2, is work in progress. In this paper we instead use a weaker result of Kuperberg’s. Finally under some additional “pseudo-unitary” assumptions the above results can be upgraded into giving isomorphisms of categories. The first way we prove the coincidences is to look at the object “P” on the side and fit it into the above schema. The second way we prove the coincidences is to figure out which object on the righthand side corresponds to the simplest object and apply the above schema to identify it as the specialization of Kauffman corresponding to . For example, in the case we have the following argument illustrated by this figure. We can realise as the vector representations in the 2-fold quotient , via level-rank duality and the coincidence of Dynkin diagrams. The figure shows a fundamental domain for the 2-fold quotient. The objects of are shown circled (with fainter circles in the other domain showing their other representatives). Now we can apply the lemma above, and instead identify these vector representations with representations in the 4-fold quotient of the unimodal representation theory of , at a particular choice of s. These identifications are shown as arrows. Note that P is sent to , the standard representation of . In particular, the knot invariant coming from P matches up with a specialization of the HOMFLYPT polynomial. For more you can also see slides from a recent talk of Scott’s, or an older talk of mine. Unlike the paper, those talks are not necessarily full of correctness, we caught a number of minor bugs in the final revisions. Noah, does that list of tensor squares of simple objects exhaust all possibilities for braided tensor categories? Certainly not, it doesn’t even exhaust all possibilities of quantum groups! There’s still the rest of the exceptional groups. Beyond that there’s the double of the even part of Haagerup where X X = 1 + X + eight other terms. Scott, definitely not! Rather, they exhaust all possibilities where we have some way of recognizing the associated knot invariant as a specialization of some other knot invariant. In general, the tensor square can be arbitrarily complicated; the rate of growth of the continuation of the sequence started by X and X tensor X ( so X, X(x)X, X(x)X(x)X, …) is related to the Frobenius Perron dimension of X (or, as we subfactor people like to call it, the index) which can be arbitrarily large. Just a sec, it doesn’t even come close to exhausting SL_n! Maybe Noah is interpreting your question as “list of tensor squares of ‘defining’ representations”? Even the fundamental representations of SL_n (i.e. exterior powers of the standard) can have more complicated tensor squares, and arbitrary irreps even more so. Ah good point. Of course, if you have to choose your object carefully before it matches up with one of a list of cases, then you may end up choosing something that doesn’t actually tensor generate the category you’re interested in identifying. But it’s a good start. Right, for example, if you do this with U_q(so_n) you’ll miss the spin representations.